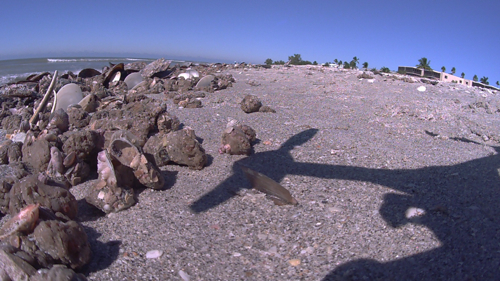 Two days after Halloween, puzzled, disappointed tourists trolled the beaches of Sanibel Island amidst piles of dead tunicates and pen shells accompanied by a smell that matched the volume of dead and dying sea life. This is the beginning of "the season," as snowbirds return to their winter playground and tourists flock to this barrier island in hopes of finding mounds of shells and pristine beaches. This year, reality offers a different point of view. Despite postings on shelling websites offering close-ups of the one or two shells mixed in with the tons of dead organisms, we have a problem down here, and it won't be fixed unless the tourists raise a fuss. In late September, a similar event happened, and the local press took note. No one seemed concerned about the cause of the event, and it was dismissed as a natural occurrence. Not so fast. This mess is not natural, unless one is willing to accept the dumping of toxin-laden water from Lake Okeechobee as "natural." The Facebook Page "Stop Lake Okeechobee Water Releases" does a good job of documenting the damage caused by these releases, and some of the documentation of "black water" is stunning. But, let's get back to the tunicates. Technically an invasive species that has been here for a long time, tunicates, AKA "sea squirts," are the filter feeders of Gulf waters. They can help with the chemical toxic soup that is flowing down the rivers from central Florida to the Gulf of Mexico. But too many tunicates can out compete other filter feeders and we all know too much of anything can be destructive. When I saw the pile up of tunicates on Sunday morning, I fired off an email to Dr. Richard Bartleson, a research scientist over at the Sanibel Captiva Conservation Foundation (SCCF) Marine Lab. We met a few years ago when I was researching a cold snap that was causing massive fish die offs on western Gulf shores. Dr. Bartleson studies the effects of river flow and management on the estuary and in the Gulf of Mexico. Specifically around Sanibel, his work tracks the effects of salinity, dark water, and nutrients, hypoxia, occurrence of macroalgae blooms, seagrass and tape grass distributions, and the occurrence of red tides. Bartleson explained that the tunicate situation reflected a "stranding," and that it was not technically a "die off" due to water conditions. It has been his observation, and more of a hypothesis, that increased fresh water flow is pushing more tunicate larvae and causing a population bloom of a singular species of tunicates from the Sanibel Lighthouse to Captiva Island. This colony is susceptible to strong winds accompanying cold fronts and the organisms literally roll with the wind and tide until they are stranded on the beaches. Tunicates are critical to the health and welfare of the marine ecosystem, and in return, tunicates, like all sea life are also dependent upon consistent salinity levels in their niche in order to survive. Tunicates can pose a danger to sea turtles since they hold brevetoxin in their tissues, and sea turtles are known to feed on them. Brevetoxins are created by the plankton in red tides. Dr. Bartleson said that in 2012-13 Kemps Ridley turtles were sickened due to tunicate ingestion, but it has not been reported as a problem in 2014. Fluctuating salinity levels due to freshwater releases from Lake Okeechobee are encouraging the overpopulation of tunicates. Sea turtles are further endangered because of the toxins accumulating in the tunicates. Talk about a lose/lose situation. Basically, the estuary and coastal ecosystem is a mess here, and no one wants to talks about it. The oyster beds are mostly gone, and oysters are also important filter feeders. 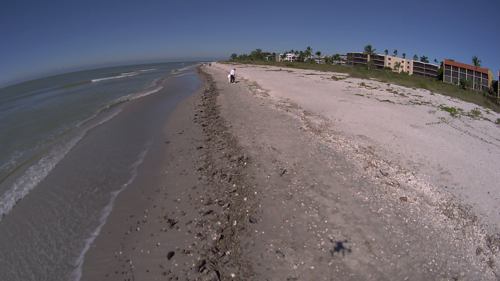 The Sanibel Captiva Conservation Foundation (SCCF) RECON program has been measuring salinity and the results are not encouraging. However, unnatural, extended releases of freshwater from Lake Okeechobee or too little freshwater during the dry season severely degraded most of the oyster reefs. Restoration efforts have also been hampered by artificially excessive variability in salinity. 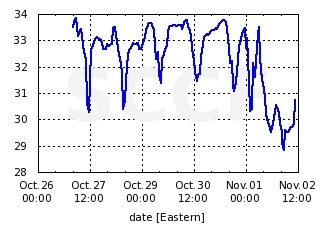 One look at the SCCF salinity graphs for October/November and it is obvious that severe fluctuations are taking place at Tarpon Bay and the Gulf of Mexico monitoring stations. To make more sense of the graph, Dr. Bartleson explained that sea water should register at 35 parts per thousand on the graph, or 3.5 percent. I am not a marine biologist and I don't have an underwater RECON device. 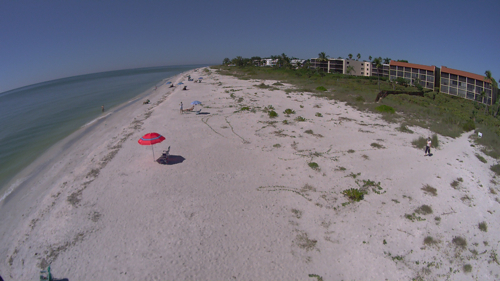 I do have camera drone and happened to be flying it this week on the Sanibel beach. The difference in the quality of our beach is dramatic from just five days ago. Tourists beware. This is what you can expect to see, and there are very few trophy shells mixed in with this mess. Unless tourists raise a fuss, the politicos in Tallahassee won't fix this. Tell them to stop sending toxin-laden fresh water from central Florida into our Gulf waters and estuaries.